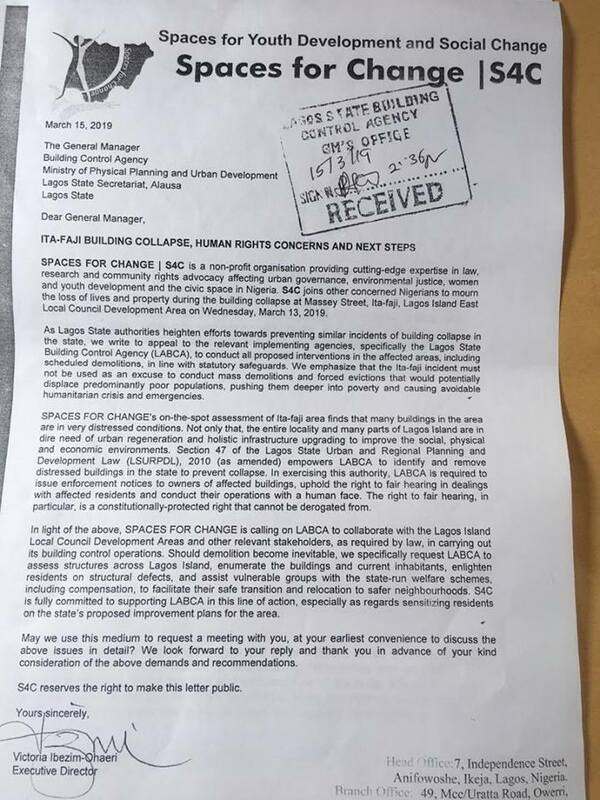 On March 15, 2019, SPACES FOR CHANGE wrote to the Lagos State Building Control Agency (LABCA) and Lagos State Urban Renewal Agency (LASURA), demanding safeguards and social protections for those that may be affected by official measures to stem the tide of collapsed buildings in the state. 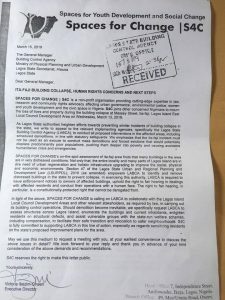 Should demolitions become inevitable, we specifically request LABCA to assess structures across Lagos Island, enumerate the buildings and current inhabitants, enlighten residents on structural defects, and assist vulnerable groups with the state-run welfare schemes, including compensation, to facilitate their safe transition and relocation to safer neighbourhoods. S4C is fully committed to supporting LABCA in this line of action, especially as regards sensitizing residents on the state’s proposed improvement plans for the area.